Figure 2: Typical test spectra from a display. Color coordinates can be calculated from these spectra. Color of individual pixels and groups of pixels can be measured and compared using microspectrometers. Flat panel displays consist of a series of colored lighted areas arranged in a pattern and can only be readily viewed with magnifying optics. Due to the high resolution of flat panel displays, they are manufactured with hundreds of rows of microscopic "pixels" on a surface. 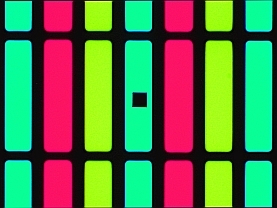 Generally, these pixels are red, blue and green though pixels with other colors are also made...for example the latest four color systems also incorporate yellow pixels. Microcolorimetry is used in display development to optimize the colors. Quality control consists of making sure that the color of each of the pixels does not vary across the entire display. For example, all the green pixels should have the same shade of green. Microspectrometers are able to gather microcolorimetric data from single pixels and from groups of pixels (if you are interested in mura). Additionally, microspectrometers are also able to map the microcolorimetric variation within even a single pixel! This leads to a new level of color precision for improved displays. The way a microspectrometer works is that the spectrophotometer entrance aperture is placed over the pixel or pixels in questions. The black square in Figure 1 is an example. The spectra is then acquired and will look something like of the spectra in Figure 2. Using the CRAIC ColorPro™ software, microcolorimetric data is generated. This can be compared with measurements of other pixels to show that the color of each sampled area is within the manufacturing parameters.